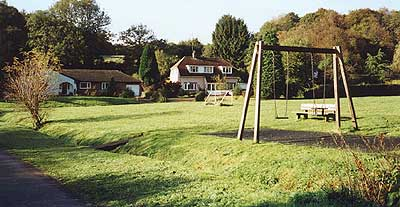 Lower Common is at the centre of the village, at the crossroad of Green Lane and Furzen (aka “Fuzzy”) Lane. It is a nice open area with a children’s swing and seat for parents, another seat to watch the world go by, children’s goal posts and (recently installed) a children’ raised walkway play area. 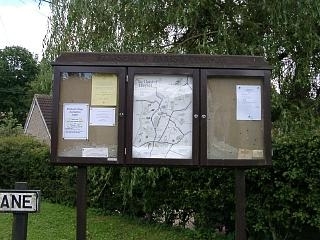 Situated on the other side of Furzen Lane is the village’s main Notice Board. At the junction of Green Lane and the Axford Road, there used to be a very ugly area that was used by Hampshire County Council’s Highways department for storing road building materials. When they stopped using the site the then parish clerk, Edna Chilton, started to investigate the site’s ownership. To cut a long investigation short, the land eventually became parish land and the site was cleared, grassed over and trees and shrubs planted. It’s now a very peaceful plot, with two seats which are often gratefully used by passing cyclists and walkers. 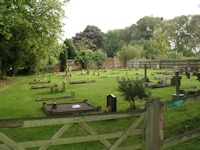 When the churchyard of St Martin’s Church became full, a plot of land adjacent to the church grounds was donated for use as a Parish Burial Ground. Extended a few years ago by another donation of a strip of land, it is maintained by the Ellisfield Volunteer Group (who also look after the Lower Common and Gravel Pits). Internment (there is also a Cremated Remains area) is restricted to Ellisfield residents unless there are very special circumstances. The earliest recorded evidence of the pond is on the Tithe map of 1841. It is believed to be a dew pond, probably originally used by watering animals, cleaning farm equipment and by passing travellers. 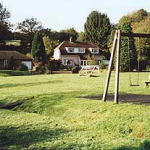 The pond had been neglected for many years (see picture left) but it was restored (between 2006 and 2009) by the efforts of a number of Ellisfield residents and with the help of a Lottery Grant which enabled the years of silt to be removed and placed in a “bung” built at the back of the pond. The story of this restoration can be found on the community website. By the side of the Ellisfield Green bus shelter is an original Gilbert Scott designed red K6 (or Jubilee) telephone kiosk which was first produced in 1936 to celebrate King George V’s silver jubilee. By the 1960s almost 70,000 of these kiosks could be found around the country. However the public payphone service has been through enormous changes since then and, whilst the traditional red kiosk has become an iconic British symbol, people use the public payphone service less and less these days. In order to maintain a social service where it is needed most, it has, in recent years, been necessary to reduce the overall number of public payphones. However, understanding that the K6 plays a significant part in our national heritage and in many cases forms a focal point for communities across the country, BT agreed to offer parish councils the opportunity to keep these kiosks, minus the payphone itself. Ours eventually became available for adoption, thus enabling the kiosk to be protected on behalf of the village. 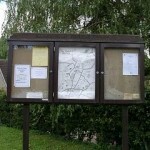 All the paperwork to transfer the ownership of the kiosk to the Parish Council was completed in May 2010. Following a public consultation, the inside was converted into a village “free lending library” with residents both donating and taking out books, magazines, CDs, DVDs, etc.